France with its capital Paris is located in Europe (Western Europe, bordering the Bay of Biscay and English Channel). It covers some 551,501 square kilometers (slightly more than four times the size of Georgia) with a population of 67,106,200. French, Breton, Corsican, Catalan, Basque and Occitan are the languages spoken by people in France (consider regional differences). Andorra, Belgium, Germany, Italy, Luxembourg, Monaco, Spain and Switzerland are bordering countries. France is a country located in Western Europe. Clockwise from the north, France borders Belgium, Luxembourg and Germany to the northeast, Switzerland to the east, Italy to the south-east and Spain to the south-west, across the Pyrenees mountain range (the small country of Andorra lies in between the two countries). France has been the world's most popular tourist destination for over twenty years (81.9 million in 2007) and it's geographically one of the most diverse countries in Europe. 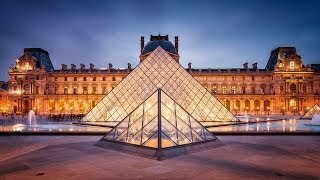 Its cities contain some of the greatest treasures in Europe, its countryside is prosperous and well tended and it boasts dozens of major tourist attractions, like Paris, the French Riviera, the Atlantic beaches, the winter sport resorts of the French Alps, the castles of the Loire Valley, Brittany and Normandy. The topography is mostly flat plains or gently rolling hills in north and west with the remainder being mountainous, especially Pyrenees in south, Alps in east. The average density of population is about 122 per km². The climate in France can be described as generally cool winters and mild summers, but mild winters and hot summers along the Mediterranean with occasional strong, cold, dry, north-to-northwesterly wind known as mistral. Potential natural disasters are avalanches, drought, flooding, forest fires in south near the Mediterranean and midwinter windstorms. To reach someone France dial +33 prior to a number. The local cellular networks are operated on 900 MHz, 1800 MHz, 3G, 4G. Websites typically end with the top level domain ".fr". If you want to bring electric appliances (e.g. battery chaarger), keep in min the local 230 V - 50 Hz (plugs: C, E). The sign for the locally used currency Euro is EUR. 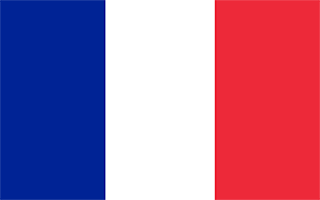 Three equal vertical bands of blue (hoist side), white, and red; known as the "Le drapeau tricolore" (French Tricolor), the origin of the flag dates to 1790 and the French Revolution when the "ancient French color" of white was combined with the blue and red colors of the Parisian militia; the official flag for all French dependent areas.